Now that I have a gallery space, it became evident I have been making relatively large textiles. An opportunity presents itself. This opportunity was about two feet of warp, left after a larger projects had been cut from the loom. I hated to see it go to waste. I had the idea of a series associated with wildfires that we’ve been seeing in Colorado and Arizona. It took me back to the devastation I’ve seen in wilderness areas in northern Minnesota. The land is savagely transformed from tall, protective, thick forests to charred ground, barren stalks of trees, exposed stone revealed. Within a year, the land begins to mend and heal itself. New growth embraces the charred landscape with fresh greenery, berries and flowers that now have new light. Meanwhile, the water – the rivers and lakes carry on. Even while the flames take the wood, the water is still beautiful. The reflections are surprising, scary, calming, clarity. The water is the healing pool that balances out earth’s scars. This series, called “Currents” reflects the water in the midst of the land’s transformation. I plan to continue to explore the water and the reflections of the transformed surrounding landscape. 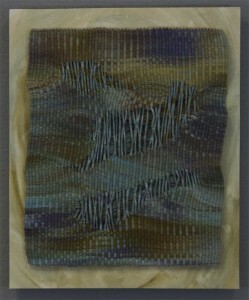 These pieces are small weavings, hand dyed yarns, some manipulated with coiling techniques. The weavings are mounted on watercolor papers and hung from a wooden frame. Come visit my studio at Artspace for the Raleigh First Friday Gallery Walk and check out my work.